What’s The Difference Between Brush DC And Brushless DC Motors? The motor and motor control markets are thriving in a number of areas, particularly medical and robotic applications. Also, there is a rich demand for small, efficient, high- and low-torque, and high- and low-power motors in the automotive sector. These applications can choose from brush dc motors, brushless dc (BLDC) motors, or a combination of both. Most motors operate in accordance with Faraday’s law of induction(see here). Still, there are key differences between these motors and in the employment opportunities that await them. Around since the late 1800s, dc brush motors are one of the simplest types of motors. Sans the dc supply or battery required for operation, a typical brush dc motor consists of an armature (a.k.a., rotor), a commutator, brushes, an axle, and a field magnet (Fig. 1) (see “Brushed DC Motor Fundamentals”). 2. A split ring wrapping around the axle, the commutator makes physical contact with the brushes, which connect to opposite poles of a power source to deliver positive and negative charges to the commutator. The brushes charge the commutator inversely in polarity to the permanent magnet, in turn causing the armature to rotate. The rotation’s direction, clockwise and/or counterclockwise, can be reversed easily by reversing the polarity of the brushes, i.e., reversing the leads on the battery. In terms of differences, the name is a dead giveaway. BLDC motors lack brushes. But their design differences are bit more sophisticated (see “Brushless DC (BLDC) Motor Fundamentals”). A BLDC motor mounts its permanent magnets, usually four or more, around the perimeter of the rotor in a cross pattern (Fig. 3). 3. 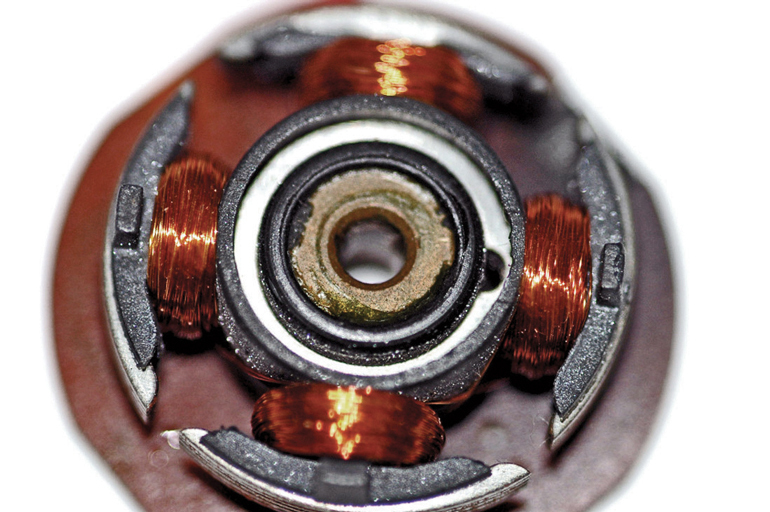 Viewed from the top, this brushless dc (BLDC) motor employs four permanent magnets mounted to the top of its rotor, eliminating the need for connections, a commutator, and brushes. Efficiency is a primary selling feature for BLDC motors. Because the rotor is the sole bearer of the magnets, it requires no power, i.e., no connections, no commutator, and no brushes. In place of these, the motor employs control circuitry. To detect where the rotor is at certain times, BLDC motors employ, along with controllers, rotary encoders or a Hall sensor (see “Brushless DC Motor Control Made Easy”). BLDC motors are synchronous motors, which means their rotors and stators turn at the same frequency. They come in single-, dual-, and tri-phase configurations (see “Brushless DC (BLDC) Motor” ). When it comes to a loosely defined range of basic applications, one could use either a brush or brushless motor. And like any comparable and competing technologies, brush and brushless motors have their pros and cons. On the pro side, brush motors are generally inexpensive and reliable. They also offer simple two-wire control and require fairly simple control or no control at all in fixed-speed designs. If the brushes are replaceable, these motors also boast a somewhat extended operational life. And because they need few external components or no external components at all, brush motors tend to handle rough environments reliably. For the downside, brush motors require periodic maintenance as brushes must be cleaned and replaced for continued operation, ruling them out for critical medical designs. Also, if high torque is required, brush motors fall a bit flat. As speed increases, brush friction increases and viable torque decreases. However, torque may not be an issue in some applications and could actually be desirable. For example, electric toothbrushes require higher speeds with decreasing torque, which is good for the brush and your teeth and gums. Other disadvantages of brush dc motors include inadequate heat dissipation caused by the rotor limitations, high rotor inertia, low speed range due to limitations imposed by the brushes, and electromagnetic interference (EMI) generated by brush arcing. BLDC motors have a number of advantages over their brush brothers. For one, they’re more accurate in positioning apps, relying on Hall effect position sensors for commutation. They also require less and sometimes no maintenance due to the lack of brushes. They beat brush motors in the speed/torque tradeoff with their ability to maintain or increase torque at various speeds. Importantly, there’s no power loss across brushes, making the components significantly more efficient. Other BLDC pros include high output power, small size, better heat dissipation, higher speed ranges, and low-noise (mechanical and electrical) operation. Nothing is perfect, though. BLDC motors have a higher cost of construction. They also require control strategies that can be both complex and expensive. And, they require a controller that can cost almost as much as if not more than the BLDC motor it governs. The bottom lines for making a choice between components of any type are the type of application and the cost cutoff for the end product. For instance, a toy robot targeting the six- to eight-year-old market may require four to nine motors. They can all be brush or brushless dc components or a mixture of both. If this robot only performs basic movements or is part of an introductory kit, there’s no need to go with long-life BLDCs that cost more than brushed counterparts. The toy or kit will probably end up in the recycling bin well before the brush motors have burned out. Typical brushed dc motor applications include motorized toys, appliances, and computer peripherals. Auto makers enlist them for power windows, seats, and other in-cabin designs because of their low cost and simple design. BLDC motors are more versatile, mainly because of their savvy in the speed and torque departments. They also come in compact packages, making them viable for a variety of compact designs. Typical apps include computer hard drives, mechanical-based media players, electronic-component cooling fans, cordless power tools, HVAC and refrigeration, industrial and manufacturing systems, and direct-drive turntables. The automotive industry also puts higher-power BLDC motors to work in electric and hybrid vehicles. These motors are essentially ac synchronous motors with permanent magnet rotors. Other unique uses include electric bicycles where motors fit in the wheels or hubcaps, industrial positioning and actuation, assembly robots, and linear actuators for valve control.